A new study provides fresh evidence that the decline in the capacity of brain cells to change, called "plasticity," rather than a decline in total cell number may underlie some of the sensory and cognitive declines associated with normal brain aging. 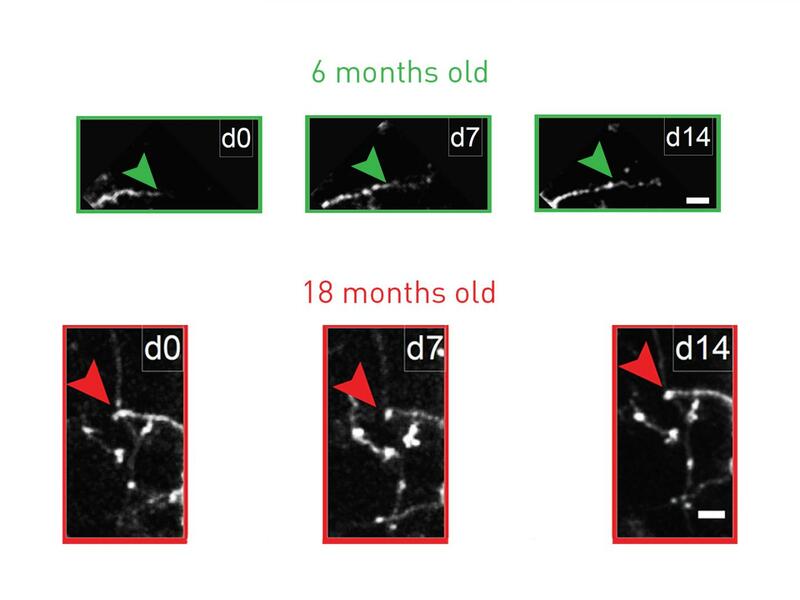 Scientists at MIT's Picower Institute for Learning and memory show that inhibitory interneurons in the visual cortex of mice remain just as abundant during aging, but their arbors become simplified and they become much less structurally dynamic and flexible. Bear's lab tested a specific form of plasticity that underlies visual recognition memory in the visual cortex, where neurons respond more potently to stimuli they were exposed to previously. Their measurements showed that in 3-month-old mice "stimulus-selective response potentiation" (SRP) was indeed robust, but its decline went hand in hand with the decline in structural plasticity, so that it was was significantly lessened by 6 months and barely evident by 9 months. In addition to Eavri, Nedivi and Bear, the paper's other authors are Jason Shepherd, Christina Welsh, and Genevieve Flanders.